I've been meaning to write about my spinning retreat since I got home but things got away from me. 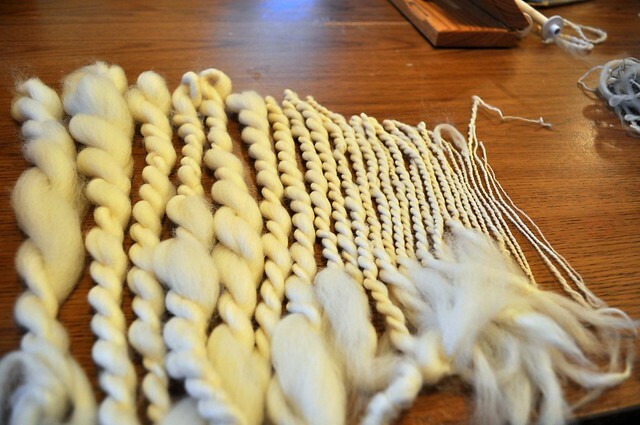 The retreat was for spinners using Hansen Crafts miniSpinners and was taught by spinning guru, Judith MacKenzie. It was a small retreat with only about a dozen or so participants. On the first night Judith gave us an overview of what we would be covering and got us to work spinning some Corriedale top. The next morning Kevin Hansen joined us and spoke to us at length about how to care for the spinners. He showed us how to replace the brake band, how to disassemble the Woolee Winder and changes to the wheels as he has worked on them. Most important to me, he explained that those of us with older spinners have a stiffer, heavier spring that attaches to the brake band. He gave me a lighter, softer replacement spring and whoa! It was like I had a whole new spinner. It became so responsive to finest adjustments. Which was great because Judith wanted us to work on diameter control beginning with spinning the finest 2-ply we could manage. Then we were supposed to spin larger and larger making fine adjustments to our spinners. Making big yarn is hard. Judith demonstrated spinning some novelty yarns. 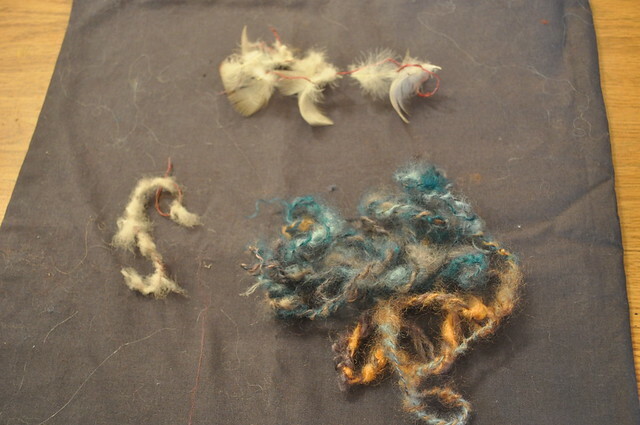 This is 60/2 silk spun with dyed mohair (bottom), duck down (left) and duck feathers (top). These are Judith's samples. 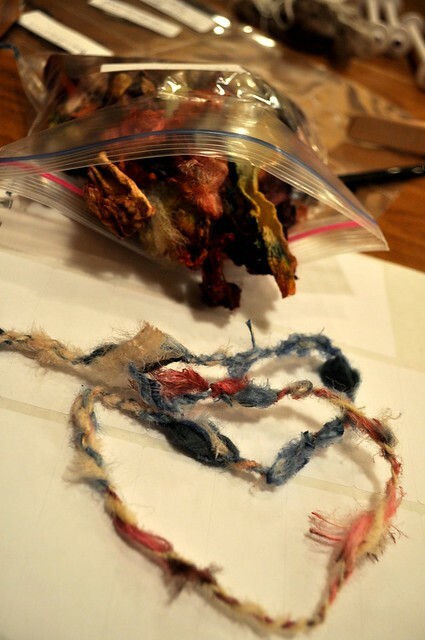 She also showed us dyed silk carrier rods. 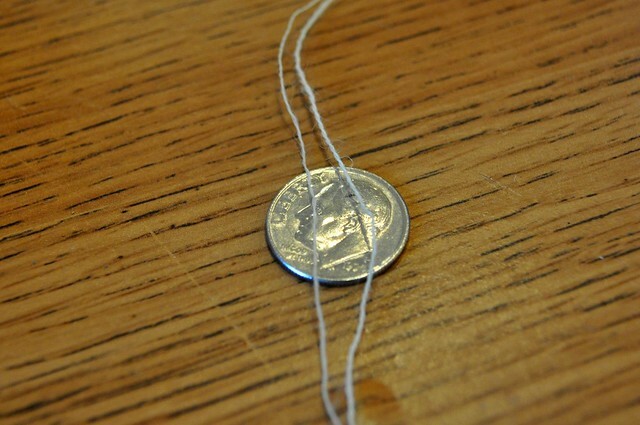 They are silk waste from reeling silk. It is stiff and papery. You can pull it apart and then lightly draft it to spin. My sample here has a whole cocoon spun into it. I would never want to knit with this yarn but I think it would make an amazing weft yarn for weaving. It's really fast and fun to spin too. I was online looking for sources right after I got home. We also spun up some bison with 3% Merino that I adored. I bought a few ounces to take home. The retreat was really wonderful. The B&B where we stayed was very nice and the innkeepers took great care of us. Other than the four hour trip home from Forks in the dark and snow and ice it was perfect.